Travel these days is nearly continuous for the Thebaid Project, for which I am very thankful! And I am greatly anticipating my first pilgrimage to Holy Archangel Michael and All Angels Skete, in Weatherby, Missouri, September 25-28. 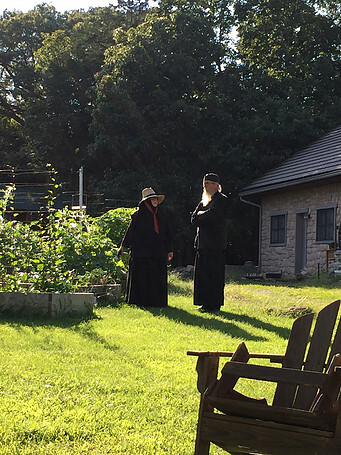 We are two communities serving God as one, Holy Archangel Michael and All Angels Skete (led by Hieromonk Alexii) and St. Xenia Sisterhood (led by Abbess Brigid). The brotherhood has two monks and one novice; and the sisterhood has three nuns and one novice. Thanks to the mercies of our Kind Creator and Savior, Jesus Christ, the prayers and sacrificial gifts of many, we acquired a property that included a total of 80-acres, with 15-acres of farmable pasture, 65-acres of forest, trails, and ponds, and 7 well-built structures…. St. Gabriel Orthodox Cemetery on one acre of monastery land with four buried here. Pilgrims visiting each month (mostly from the Greater Kansas City area, but others from Des Moines, Omaha, Lincoln, St. Louis, Denver, Idaho, Alaska, and as far away as Eritrea, Ethiopia, Croatia, Serbia, Ukraine, and Russia). Visit Holy Archangel Michael and All Angels Skete website for more videos and photos, and catch up on the news of their life.